The spirit of Mandela Day has gone global, with countries around the world celebrating Nelson Mandela’s birthday by donating their time to helping others. In Fiji, Ian Campbell of the WWF joined Projects Abroad to educate local children at the Multi-Cultural School on the importance of protecting sharks. As part of the day, teams of children and volunteers joined forces to clean up the local village and beach, collecting over 20 bags of rubbish. Ian Campbell, who heads-up the WWF Shark program in Fiji, described the day as “inspiring”. 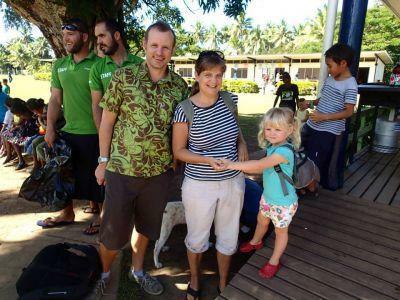 Apart from just cleaning the town and beach, volunteers from Projects Abroad also distributed food parcels to the needy in Nadi and Lautoka. The spirit of Mandela Day was not just limited to Projects Abroad Fiji , as volunteers from around the world got involved in spreading Madiba magic. “We have had people as far as Tanzania, Togo and Thailand getting involved in Mandela Day outreaches,” says Kent. Nelson Mandela fought against the apartheid system in South Africa, spending 27 years in prison before being released and chosen as the country’s first democratically elected president. This is the first year that Mandela Day has been celebrated since Mandela’s death in December 2013.